San Telmo is a special neighborhood in my history of living in Buenos Aires. I lived in the heart of the San Telmo Market during my first year in the city, on Defense Street steps from Plaza Dorrego. Every Sunday I had the pleasure (or a hungover person's nightmare) of having the San Telmo Fair right on my doorstep. Wear comfortable shoes. You’ll walk a lot and slowly which takes it’s toll on your back and legs. Wear flat soles or risk breaking an ankle on the cobblestone. 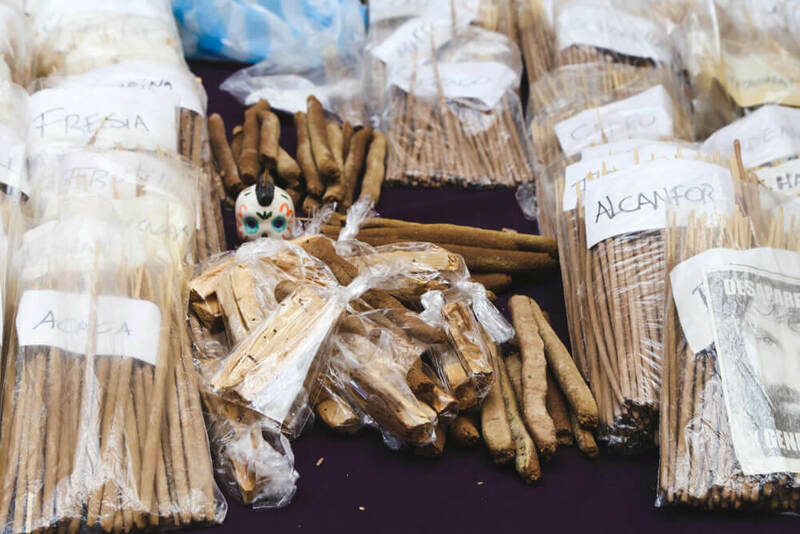 The market takes place every Sunday, converting the cobblestones of Calle Defensa into a treasure hunter’s dream. The hours are technically from 10 am to 4 pm. However, Buenos Aires isn't exactly geared towards the early riser. You won't find much activity until the afternoon. And even though vendors began dismantling their stands by around 5, the action continues well past sunset with drum troupes marching down the street and tango dancers taking over Plaza Dorrego after dark. Start you day slowly, enjoy a leisurely brunch or do as the locals do and sleep in. Sunday mornings are sleepy affairs in Argentina. When ready to begin your afternoon, start in Plaza de Mayo. You can take the Subte Line D to the Catedral Station to get there. The San Telmo Market takes up the entirety of Defensa Street, beginning in the Plaza de Mayo and puttering out at San Juan Avenue 12 blocks later. Buenos Aires is generally poor in street food. But throw that idea out the window when it comes to the San Telmo Sunday Market. The sidewalks fill with street vendors selling choripan (chorizo and crusty bread sandwiches), fresh squeezed orange juice, empanadas, candied almonds, and more. Pro tip: skip the pan relleno salesmen, you're more likely to get a lot of bread, and not a lot of filling. Keep an eye out for the Colombian guys walking up and down Defensa selling Colombian coffee. They've been here for years and it really is the best coffee in the neighborhood. NOTE | Looking for where to eat in San Telmo? At the end of this post I list all my favorite San Telmo restaurants and bars. PLAZA DORREGO | Plaza Dorrego is antique central. It's full of random baubles, jewelry, and anything you can imagine. There are a few stands here offering antique seltzer bottles that are very (heavy and) popular with visitors. BRICK & MORTER STORES | Amidst the exchange shops and new hipster bars there are still quite a few physical antique shops. Don't expect to find the bargain of the year here, but there are high quality, beautiful antiques to be found. 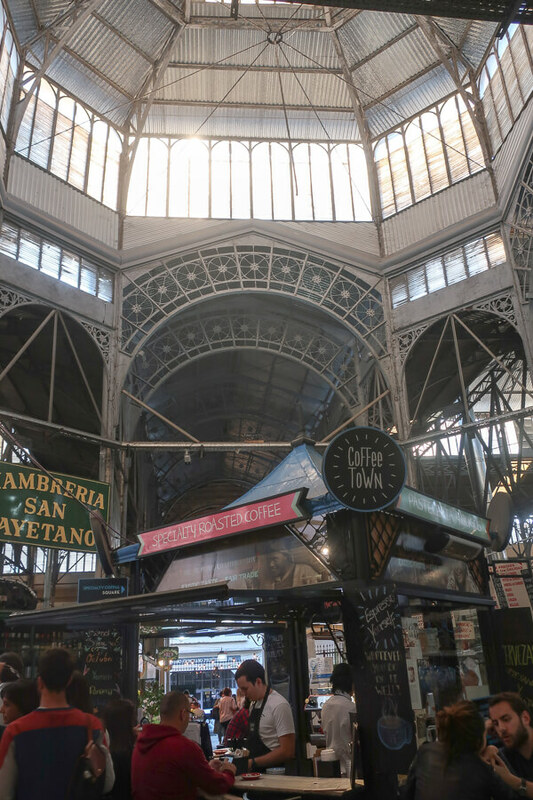 MERCADO DE SAN TELMO | There's a permanent market (seen below) that occupies most of the block between Estados Unidos and Carlos Calvo streets. There are entrances on all four streets: Estados Unidos, Defensa, Carlos Calvo, and Bolivar. There are permanent shops inside selling antiques and vintage clothes. Inside there's also a fruit and vegetable market and various restaurants. Something happens to tourists in a market that requires them to walk at such a glacial pace. When you need a breath of fresh air step just one block off of Defensa to either side (to Balcarce or Bolivar). San Telmo is one of my favorite places in Buenos Aires and it isn’t because of it’s weekly antique and craft market. 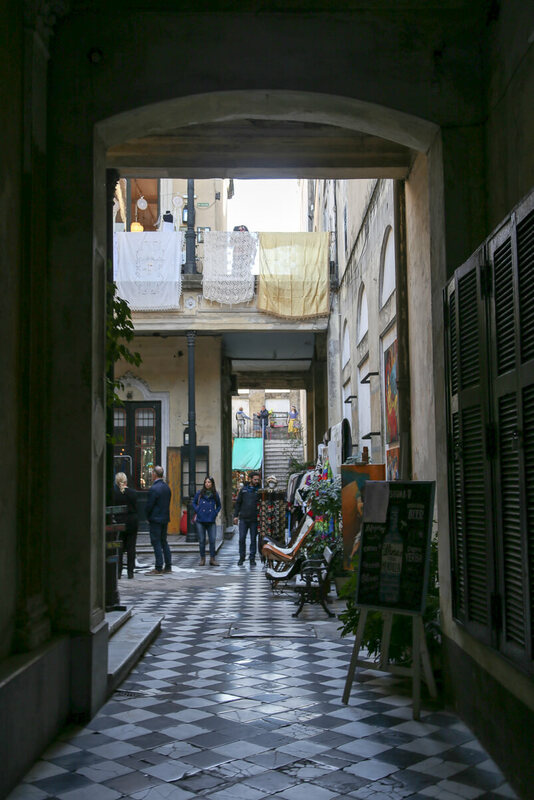 Enjoy the street art, the historical but decaying old buildings, and a bit of personal space before diving back into the market. There are a few street performers that seem to be staples in the market but none more so than Gardelito. Gardel is one of the best Tango singers in Buenos Aires’ history. If you’ve heard tango, you’ve most likely heard Gardel. Give Gardelito a tip and listen to the closest thing to Gardel himself. 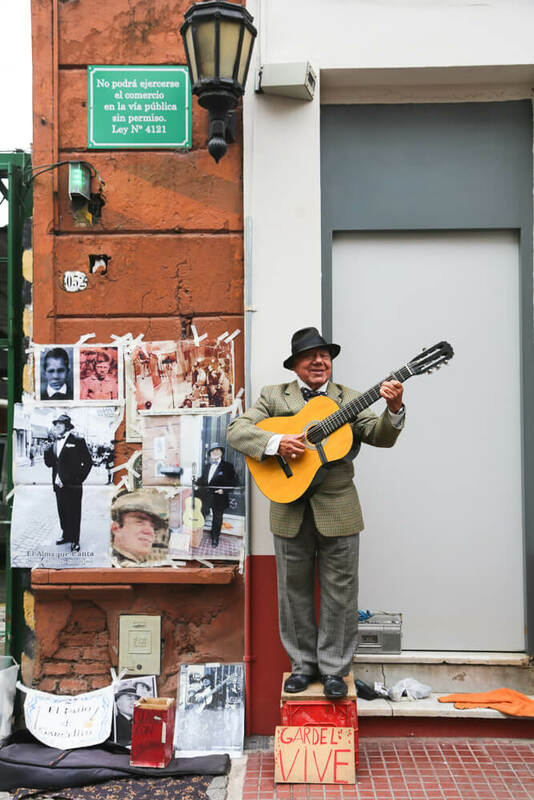 He performs every Sunday afternoon just before Plaza Dorrego next to a parking lot on at Defensa 1053. Below is a map marking out all my favorite things to do in San Telmo, market day or otherwise. The northern highlighted yellow square is the Manzana de las Luces and the second one further south is the fixed antique market. 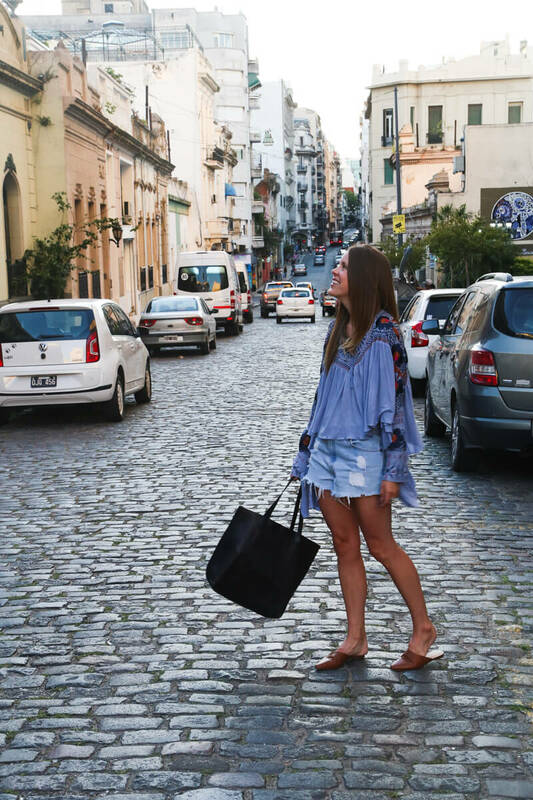 Read more on each below as well as the details on all my favorite San Telmo highlights. There is so much more to this neighborhood than it’s weekly market. San Telmo is one of the oldest neighborhoods in Buenos Aires and is home to much history. If you’re not in town on a Sunday, don’t worry, there is plenty to do here besides the San Telmo Market. 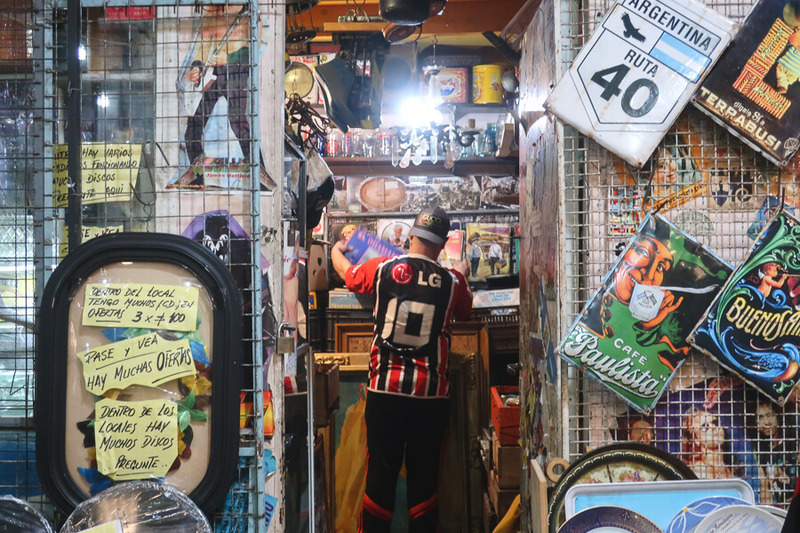 Here’s a list of things to do in San Telmo, whether you can only visit during the week or just want to add onto your Sunday itinerary. One block in from Plaza de Mayo you'll find the Basilica de San Francisco. If you hang a right at the historical pharmacy on Alsina and walk two blocks you'll find the Illuminated Block (or Manzana de las Luces), named for the intellectual institutions that occupy the block. The streets that form the block are Alsina, Peru, Moreno, Bolivar and Avenida Julio A. Roca. The institutions include the Colegio Nacional de Buenos Aires (the most prestigious secondary school in the country), the San Ignacio church, and the old Buenos Aires University building, among others. There’s a statue of the most famous Argentine comic strip character Mafalda at the intersection of Defensa and Chile streets. If you want THE cliche San Telmo picture then you have to take a picture with Mafalda. On Sundays you will probably have to wait in line but during the week there will be no one here to get in your way. When Jorge Eckstein bought this land in 1986 he had plans for a restaurant. What he discovered was centuries of history buried below street level. Buenos Aires was built on a series of creeks and river tributaries and this museum tours the tunnels built to accommodate them. The tour takes 50 minutes and is worth every second. The building is gorgeous and the tour is well done. There are artifacts on display in the basement museum but the highlight are the tunnels that run below the entire block. The narrowest house in the city is just meters from the Zanjon de Granados. Until recently you could only admire this tiny little house’s exterior, but they remodeled it and opened it for tours in 2018. Legend has it that after the owner of the main house emancipated his slave, he gifted him with this sliver of land to build his home. If you want to see inside this house (and boy do I) and learn about the myths that surround it, you can tour it on Fridays and Sundays. There is only one tour on each day available in English, confirm times and prices here. One of my favorite not-so-hidden secrets of San Telmo is the Pasaje de la Defensa. This historic mansion was the home of the aristocratic Ezeiza family built in 1880’s. When the yellow fever epidemic struck, wealthy families like the Ezeizas abandoned their homes and moved to the countryside, to what is present day Recoleta and Belgrano. Their single family homes became multi-family “conventillos” (tenement homes). Today the Pasaje de la Defensa is filled with antique shops and cafes. You can rest in the courtyards where the wealthy Ezeiza family lounged and the poor tenement families shared laundry and kitchen spaces. Random fact: when the Bachelorette filmed in Buenos Aires, Jojo and Jordan filmed their dinner date here after spending the day in Mendoza! A few of the most historic tango shows are right here in San Telmo. El Viejo Almacen, Bar Sur, and El Querandi all call San Telmo home. Tango dancers take over Plaza Dorrego every Sunday as the antique vendors pack up. It’s one of the traditional barrios tangueros (tango neighborhoods). If you’re having a difficult time choosing a tango show, read my list of the best tango shows here. And finally, where to eat. Always the most important question of them all! When you need a break from walking and shopping there's nothing better than resting your weary bones with a drink or a meal. End the day with a relaxed steak dinner and a Malbec. You deserve it if you walked this market all day. DESNIVEL | Defensa 855 | This is my favorite steak in the city. It may look kitschy and touristy but the food is incredible. Order one of the lomo (tenderloin) dishes. My favorite is the Lomo a la Mostaza, tenderloin in a mustard cream sauce. LA BRIGADA | Estados Unidos 465 | I have yet to eat here, because Desnivel, but I hear this is Francis Ford Coppola's favorite spot in town. They'll cut your steak with a spoon for you before serving it, so you know the meat is tender. DORREGO CAFE | Defensa 1098 | Located on the corner of Plaza Dorrego, insultingly across the street from Starbucks. Come here if you want to have a coffee while feeling as if you traveled back in time. COFFEE TOWN | Mercado de San Telmo | This coffee stand is located inside the market I mentioned above. It has great quality coffee and offers a chance to people watch while you sip on your flat white. NILSON | Carlos Calvo 463 | Nilson is a cozy little wine bar and is new to the San Telmo scene. They serve some of the best wines by the glass. The menu isn’t divided by red or white but by intensity, making it easy to choose the best glass for your taste. Notable Bars are historically protected bars and are loaded with character. My two favorite ones happen to be in San Telmo. EL FEDERAL | Carlos Calvo 599 | Worth a stop even if you aren't hungry, just come and have a fernet and enjoy the vibe. But if you're hungry, order a picada (a charcuterie plate). They're incredible here. LA POESIA | Chile 502 | Come with your journal or laptop and feel like a 1920's intellectual writing the work of the century while sipping on a cortado. Argentine ice cream is the unsung hero of Argentine cuisine. NONNA BIANCA | Estados Unidos 425 | There's more than one chain restaurant selling ice cream along Defensa but I prefer this mom and pop operation just off Defense on Estados Unidos.